1- Tell us about Chester Kollschen. Who are you? On paper, I'm a certified computer scientist, but actually, I've always been and will always be a game developer with heart and soul. I am forty-one years old and a big fan of classic computers and vintage video game consoles. 2 - Which was your first experience with a computer? In the shop window of a local toy store, a strange new device was presented. 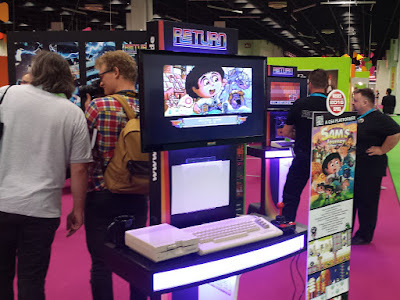 It was connected to a television set and you could move a character across the screen using buttons. I was six or seven and immediately hooked. 3 - Why the Commodore 64? What made you choose the C64 instead of another more popular computer at that time? Soon after my moment of epiphany in front of that store, I knew I wanted to create games. The Commodore 64 home computer was introduced by that time and I realized that it would be the perfect machine to get started. 4 - What hardware/games do you still have of your youth? And your first C64 game? 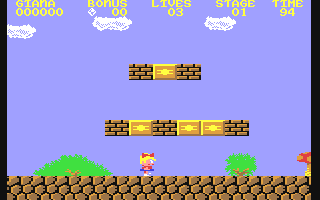 My first game on tape was D-Bug by Electronic Arts and the first game I had on disk was The Great Giana Sisters by Rainbow Arts. I still have a Commodore 64, a Nintendo Entertainment System, a Super Nintendo Entertainment System, a Sega Dreamcast and some Gameboys. For each of those devices I also have a small number of original games. 5 - Can you tell us how you began to make programs and what tools you used and are using right now? When I finally got my C64, I began to write my first programs in the BASIC programming language. 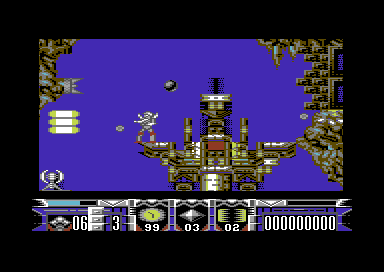 The BASIC was one of the C64's biggest advantages because it was built-in. You could switch on the C64 and immediately start creating something. Today, I write games for classic computers in assembly language on a conventional desktop computer because it's faster and more comfortable to work with, especially for larger projects. Nevertheless, I transfer the game to the real machine very often. You need to test with actual controllers to check if you got the controls right. 6 - Which is the title of your catalogue you feel most proud about and why? That's a tough one because each of my games made me proud in one way or the other. Ice Guys was my first professional game so I was proud when I completed it. 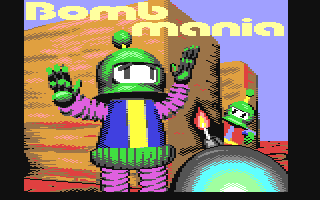 Bomb Mania on the other hand became one of the most popular games on computer parties. Metal Dust for the rare and exotic SuperCPU was quite a challenge due to the lack of proper tools at that time - and yet we made it! But I have a feeling that Sam's Journey is going to make me proudest of all. It's my biggest game so far and has many interesting gameplay features. 7 - You now are finishing the development of Sam's Journey. What differences are there between the way you programmed before and how you do it now? 8 - Tell us about your team, Knights of Bytes. I founded Knights of Bytes as a game development label in the 90s. It started out as a one-man-show with occasional helpers on a per-project basis. Since the inception of Sam's Journey, three people are onboard. Stefan Gutsch is our 2D artist. He is drawing the beautiful graphics and mapping the levels. Alex Ney is our musician. He composed the game's awesome soundtrack, made up of 19 songs. And I am supervising the project and doing the programming. 9 - Give us some technical and playability information about Sam's Journey. 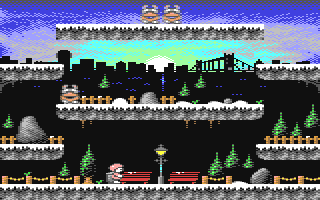 Sam's Journey is a brand-new original scrolling platform game developed for the Commodore 64 home computer. It's about a cute little hero called Sam who finds himself on an unexpected journey in a strange world. If you like games like Super Mario Bros 3 (NES), Kirby's Dreamland (NES), Kid Chameleon (SMD) or the Donkey Kong Country series (SNES), then Sam's Journey is definitely a game for you. Being great fans of the platform genre ourselves, we tried to incorporate many of our favorite features into our game and yet make it unique on it's own. Sam is a very versatile hero. He has many basic moves such as running, jumping, climbing, swimming, picking up and carrying items and using or throwing them around. But the greatest feature are the six different costumes that completely change Sam's appearance and give him special skills! As the game is quite large, there are no such things as limited lives or even a game over. Instead, you can explore the levels, advance in the game and save your progress at any time. 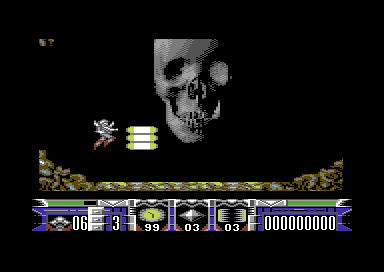 The game will come on either two 5.25" double-sided disks (PAL/NTSC) or on a cartridge (PAL) with integrated save-option. 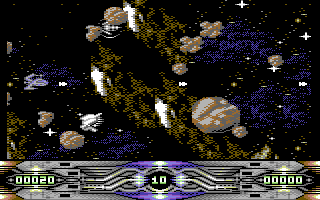 10 - Will games like SJ and the recents Caren & the Tangled Tentacles and Unknown Realm force developers to raise the level of quality in future C64 commercial releases? 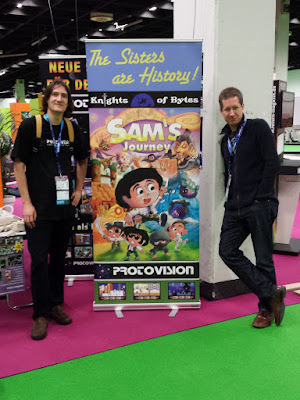 With Sam's Journey, it's our goal to take C64 platform games to a new level. The Great Giana Sisters and Mayhem in Monsterland set the standards here and we are very excited to see Sam take the challenge! :) The team behind Unknown Realm is certainly attempting the same in the genre of Ultima-style RPGs and they are going to impress their fans with size, complexity and a great presentation. Other high quality projects are known to be in the making, such as Caren And The Tangled Tentacles that the friends of point-and-click adventures are looking forward to. However, all those games are examples of large-scale productions. 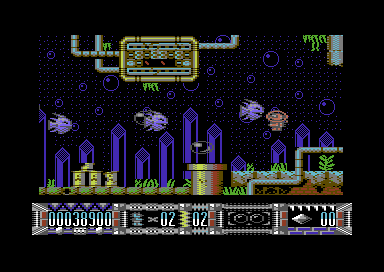 I believe there will always be new C64 games of all sizes and that's a good thing! This versatility is what makes the C64 so great. 11 - Have you got any game you left aside? Why? 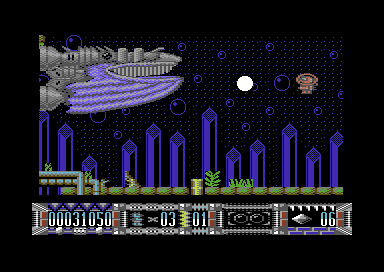 12 - What do you think about the fact that after so many years, the scene of C64 is so active and they are even still producing new programs and videogames? 13 - What do you think about the latest videogames for the big platforms? Do you think that the characteristic traits are lost? While I really do admire the technical improvements in today's games in terms of graphics, speed and realism, there are many things that, in my opinion, went into the wrong direction: unfinished games with downloadable content, free-to-play aka "freemium", in-game-advertising, missing single-player campaigns, social media integration, achievements, the necessity of registrating, ten hours of updating... There's so much noise that distracts from the most important thing: the game itself! However, I do like point-and-click adventures which luckily are still being made today. 14 - New projects in mind? Yes, we have several concept ideas that we are considering for the time after Sam's Journey. It's a bit too early to talk about them, but one or two of them might as well be C64 material. 15 - When will be Sam's Journey be available? Thank you for answering all those questions. More information in the official website of Knights of Bytes.